Vicki has really created something incredible with this breed. Not only because they are breathtakingly gorgeous, but because they are highly intelligent, have the most incredible temperaments and personalities to match! From the moment I picked up my boy he has been the most incredible gift I could ask for. He has been a love and a joy from day one as well as extremely trainable. I didn't have a problem potty training him, and expected it to take much longer than it did. Along with being incredibly smart, Niklaus is also the sweetest, most loving boy. He is very social with other dogs and has never exhibited any signs of aggression. All he wants to do is play with any dog he meets, both big and small. He is very gentle with tiny dogs as he is being raised with two under 10lbs, but also plays hard with larger dogs such as my other shepherd. He definitely knows how to act in different situations and I never worry about him acting inappropriately. Niklaus loves to give hugs and they are so wonderful because of his size. He jumps up, his paws wrap around my shoulders, and his head is level with mine when he does (I usually get kisses at this point too!). At only a year old he is about 27 inches tall at the shoulder and weighs 70lbs. We are expecting him to grow more in this next year. Prepare yourself to answer many questions about your Blue Bay Shepherd wherever you go! Sometimes a 3 mile walk on the beach can take 2 hours because we are constantly being stopped. I bring him to many crowed events and he does very well, however I do answer the question “what kind of dog is that?” a minimum of 100 times and generally have a number of people also ask to take his picture. Recently at an outdoor art show a local artist asked to take his picture so he could paint him. (We look forward to seeing the final product J ). If you decide to make a Blue Bay Shepherd a part of your life you will absolutely not regret it! I think that anyone who has seen Slate or Jordan knows immediately that any offspring from two such magnificent animals would have to be beautiful, intelligent, and exceptional. And anyone who has had previous experience with Vicki Spencer knows that she takes great care in breeding quality dogs with dynamic personality and excellent temperament. Almost thirteen years ago, I met Vicki and, before selling me a puppy, she insisted on my commitment to care for the puppy she was entrusting to me. My dog Chinook is now going on thirteen years old and she has been all Vicki promised. I see that same dedication to breeding excellence in her development of the BBS line. I know firsthand the many years Vicki has dedicated to establishing this extraordinary breed. When the opportunity came for me to make a BBS puppy a part of my family, I was eager to do so. What can I say about my BBS? He's a show-stopper. His blue color is stunning, his pale green eyes are piercing, and at 10 months old, he is nearly 90 lbs. Taking him out into the public is an experience. People constantly ask me about his breed because they've never seen another dog like him, they ask to take photos of him, follow me around pet stores trying to get a better look at him. It once took me a half an hour just to get IN the pet store because of so many stopping me in the parking lot. My BBS is not only stunning but playful, ornery, intelligent, and loving. He wants to be a lapdog, seeks your hand when it's close enough to pet him, travels well, and will steal toys from other pets. He loves being outdoors, loves being the center of attention, and has brought joy to our household since the day he came home. Consider a BBS. It will be the best pet that ever owned you. We have known Vicki for over 15 years now and have always admired the animals she has produced. We could never get one of her pups because we had enough dogs and didn’t need another one. However, when she told me about her Blue Bay Shepherd (BBS) breeding program, I knew that I wanted one of those pups. Not only was the allure of the BBS tempting, but some of our animals had passed on and the remaining ones were geriatric (between 14 and 16 years old). In a slightly bittersweet way, it was perfect timing for us to bring home another dog. We drove by Vicki’s place in May 2011 and left with a BBS (Dillon/Passion) puppy that we named Blue Jasmine, or Jazz for short. She is exactly what we needed and wanted! She is an inside dog with tremendous energy. We have to take her for frequent walks and to the dog park to burn off some of that energy; she would probably do well as a service dog (though we haven't worked with her in that fashion). She does ok with other dogs. While at the dog park when she was younger, an aggressive dog chased and bit her along the back and flank, so she is now somewhat leery of other dogs—in particular, the ones who are more aggressive and assertive. Older dogs and those who are laid back do not bother her. But her favorite animal of all does not run on four legs; she absolutely adores people and has never met a stranger she doesn’t like. She loves kids, strangers, the mailman (though he is afraid of her and she can’t quite figure that one out), the UPS guy (who loves her! ), etc. ; she loves EVERYONE! Sometimes I wish she were a little more aloof, but then she wouldn’t be Jazz. She lives inside, but we need to crate her when we are gone. Thankfully, my job allows me to work most of my time at home, so I’m gone only 3-4 hours at a time, at the most. We don’t trust her not to shred things (shredding is her favorite pasttime--toys, paper towels, toilet paper, students' essays, etc.). She was pretty good as a puppy, not teething on much at all other than her toys. She took some work potty training, but once she got the hang of it, it stuck. She never goes potty in the house—though she will submissively pee when we get home and let her out of her crate, so we set the pee pad in front of her crate prior to letting her out. Easy and efficient since you don’t want to reprimand a submissive pee. Jazz has SO much personality. Compared to many of the 29”+ dogs that I’ve had, she is a tiny girl, at only 26” at the shoulder, but for an inside dog who thinks she is a lap dog, that is plenty big enough! Her personality, though, is SO much bigger. She is mouthy, both with objects going into her mouth AND with her backtalk. She lets us know (in no uncertain terms) how she is feeling and is quite the talker—but she doesn’t do the yappy barking of many other dogs. She is also easy to get to howl. All you need to do is howl once to get her attention and then once you have it, howl again. And that will start her howling. She loves to vocalize, but (as I said) it isn’t the vocalizing of a barking or yapping dog; it’s more of a growly, moany, howly sassiness, which we are quite used to as we had her cousin (who was exactly the same—a sassy talker) for 15 years, until she just passed this December. So Jazz is now picking up where her older cousin left off. Jazz is our little baby girl, and I can’t thank Vicki enough for this wonderful and loving dog who is SO full of personality! I first learned about Southern Breeze’s Vicki Spencer and her breed in development “Blue Bay Shepherds” approximately 4 years ago. We began a thoughtful correspondence by phone and email, which culminated in me placing a deposit a year in advance on a planned litter of Blue Bay Shepherds. Having rescued a dog before from an unethical breeder, I was impressed by Vicki’s knowledge, devotion to her animals and willingness to answer my many questions. 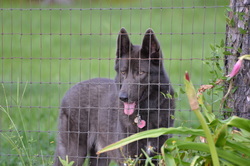 Vicki screens potential owners carefully since the Blue Bay Shepherd is a breed suitable for experienced owners with experience living with primitive and working breeds of dogs. My dog was from the first litter of Blue Bay Shepherds born in March 2011. 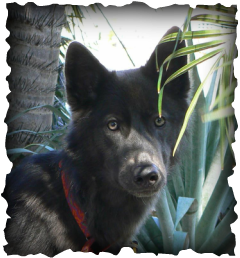 I selected him based on temperament first – his mother Kai and father Jordan are both friendly and outgoing and secondly on his solid blue color and plush coat since I did not want a longhaired dog. I explained to Vicki what I was looking for in a dog and she gave me exactly what I was looking for. My dog arrived when he was 8 weeks old and he was practically house broken. I can count the incidents he had an accident in the house on my fingers and he never defecated in the house. At an early age, his friendly, alert manner was conducive to obedience training. My dog responded to gentle reinforcement, he is sensitive and responsive to his environment and did not need to be shown many things twice. My dog’s intelligence means sometimes he will disregard a command and become playful but he is never aggressive. My dog gets along with all other dogs but occasionally he has engaged in dominance displays with other males and he occasionally will guard toys from other dogs, which has improved with training. Given his appearance and size, it has been a process educating other dog owners since they will occasionally label him in a negative way due to his appearance. My dog is gentle with small dogs and he has been socialized with cats. However, my dog has a high prey drive so this has required close supervision.